The only difference between the Free Version and the Scientific Version is that the Free Version is ad-supported. The keyboard is a simple layout of 34 keys. The keys are labeled with one function. To access the shift function, press the gold shift key. The names of the shifted function replace the primary functions. Kudos for simplicity, however, my personal preference is to see both the primary and shift functions at the same time. The default mode is RPN (Reverse Polish Notation), but you can always enter an algebraic formula by pressing the "=f" key. The "=f" becomes the "=" to terminate entry of the formula. 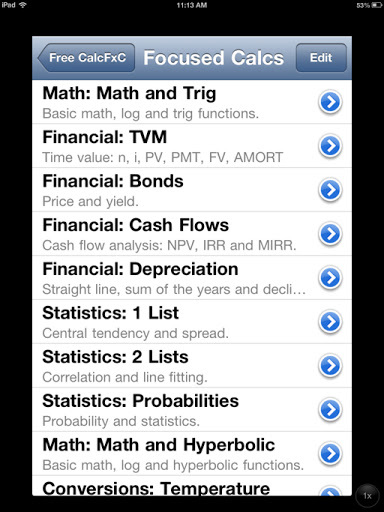 Accessing the Focused Calculator list gives many calculators such as Math and Trig (the main calculator), Time Value of Money, Bonds, Statistics, Probability and Conversion calculators. For me the Conversion calculators leave a little to be desired, since there are no direct conversion keys attached to the default keyboard (luckily, that can be remedied!). In addition to the Focused Calculators, CalcFxC gives formula template calculates. Among these formula calculators you have Percent Change, Distribution Functions, and the Quadratic and Cubic Equations. The keyboard gives a good response when the "keys" are pressed. The screen is a two line (adjustable) screen which displays the y-stack and x-stack. The stack is four levels. Help can be accessed by pressing and holding a key. The calculator operates on real numbers only. So, entering √-1 will return an error. As a consequence, the polynomial solvers return only real roots. The numbers range in the order of -10^-308 to 10^308. There are no fractions or exact values of trig functions. jn: Bessel Function of the First Kind, with x on the y-stack and the order n on the x-stack. jn also returns the Bessel Function of the Second Kind. quad: Takes three arguments from the stack (a, b, c of ax^2+bx+c) and returns the real roots. If you want to access the hyperbolic functions, you will need to call the Math and Hyperbolic calculator. The calculator has 27 memories: memories a through z, and a special register ra. Storage and recall arithmetic can be performed on register ra - no idea why (except for maybe programming limitations) CalcFxC decided to restrict this feature to one register. CalcFxC does not offer "traditional" macro or program capability. Instead, CalcFxC offers the ability to edit and create custom keyboards. You can redefine the key's name and help screen, along with it's formula. You have access to all of the functions. To use the stack arguments, use rgx(), rgy(), rgz(), and rgt() for the x, y, z, and t stacks respectively. This is a fun feature for those who has ever wanted to design their own calculators, and I am one of them! To emulate the stack operations properly, you will need to define the formulas for each stack. Functions can be copied and pasted. 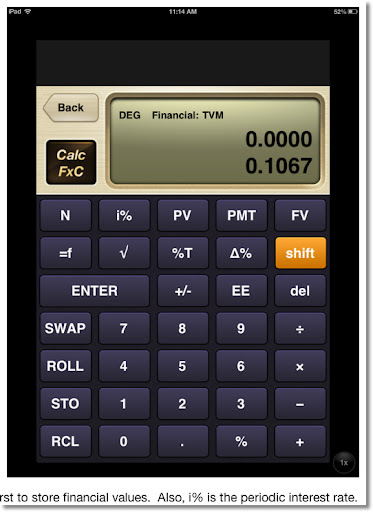 You will need some experience with RPN calculators to take advantage of this feature. This app is enjoyable to use. I am probably going to spend an afternoon or evening making a custom calculator. 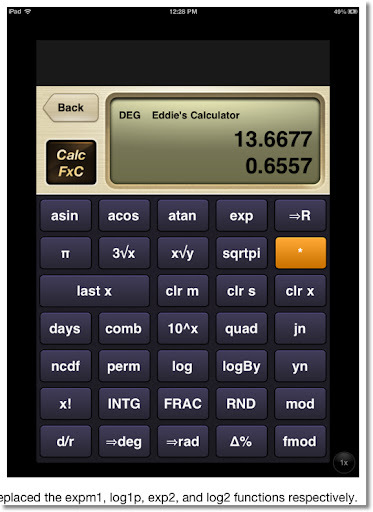 RPN fans, this is a good calculator app to get. Since I am not a fan of ads, I will pay the $0.99 to get the non-ad version. This blog is property of Edward Shore. 2012. Monday's blog entry (10/22/2012), Factorials and Arrangements of Unique Objects dealt with permutations of arranging a group of objects where all the objects are unique. Today's blog entry looks at three situations where objects can be repeated. This is where you make permutations in which all the objects are available for each slot. For example, let's take a five digit zip code. There are five slots and for each slot the 10 digits are available: 0, 1, 2, 3, 4, 5, 6, 7, 8, and 9. For the first slot there are 10 choices. For each of the 10 choices, the second slot presents another 10 choices. For each of those 10 choices, the third slot presents another 10 choices. And so on. The number of arrangements is: 10 × 10 × 10 × 10 × 10 = 100,000. There are 100,000 five-digit zip codes possible, 00000 to 99999. Remember when calculating permutations, order matters. For our example, 11110, 11101, 11011, 10111, and 01111 are five different arrangements. The general rule is presented below. This is similar to the first situation in the way of calculating the number of permutations (arrangements). Let's say we are on a very famous game show. One of it's mini games is played for a car valued anywhere from $20,000 to $59,999. We want to know how many possible prices for this game are possible. Looking at the range from $20,000 to $59,999: we can see the choices for each of the five digits. The first digit must be a 2, 3, 4, or 5. The other four digits can be anything 0 through 9 (10 choices each). The number of prices possible are 4 × 10 × 10 × 10 × 10 = 40,000. So using a random guess, the contestant has a 1 in 40,000 choice in getting the price exactly right. Another mini-game offers cars from $11,111 to $36,666 where the first digit is given to the contestant (1, 2, or 3) and the contestant tries to roll the other four digits using a single die. The die contains the numbers 1, 2, 3, 4, 5, and 6. Our task to find out how many prices are possible. There are 3 choices for the first digit, and 6 choices for the other four digits. The number of prices possible are 3 × 6 × 6 × 6 × 6 = 3,888. This mini-game can be played up to 3,888 times before a price repeats. In this situation we are finding the number of permutations of a group of objects, except some of the objects repeat. Let's try to find the number of ways to arrange the letters in the word PHYSICS, removing any restriction that the arrangement has to make a sensible word (HYSSICP would count as arrangement). In the word PHYSICS, there is 1 "P", 1 "H", 1 "Y", 2 "S"s, 1 "I", and 1 "C", for a total of 7 letters. PHYSICS counts as one permutation, regardless which "S" is used in each slot. We still have 7 letters, which can be arranged 7! = 5,040 ways, but have to account for the 2 "S"s.
The true number of ways to arrange the letters in the word PHYSICS is 2,520 ways. Coincidentally, the calculation is really 7! / (1! × 1! × 1! × 2! × 1! × 1!). However, 1! = 1. Hence, 1! × 1! × 1! × 2! × 1! × 1! = 2!. Let's take another example. Find the number of ways to arrange the letters in the "word" AAABB. In this example, there are 3 "A"s and 2 "B"s for a total of 5 letters. The expression above is known as a multinomial coefficient. Marcus, Daniel A. "Combinatorics: A Problem Orientated Approach" Mathematical Association of America, Washington DC. 1998. This blog is property of Edward Shore, 2012. 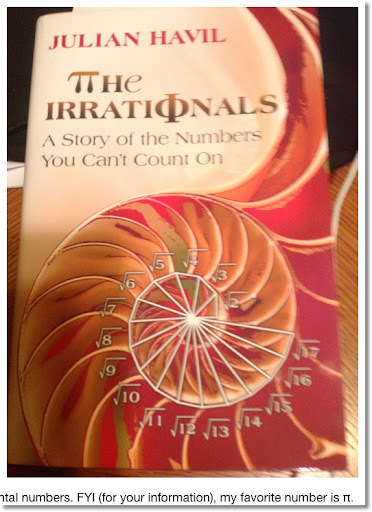 Last weekend my dad asked me about my blog, and the last entry was about factorials of large numbers. Clicking on this link will take you there. On our way to classic car auto shop in Orange, CA; my dad and I talked about the factorials as I tried to come up with a way of finding applications using factorials. Last weekend became the inspiration for my blog entry. Love you, Dad. Start by multiplying n by n less 1, then multiplying the product by n less 2, and repeat until you get to 1. Simply put, 0! = 1 is just defined this way. In this section, we consider three common arrangement problems. The task is to find the number of possible permutations a group of objects can be arranged. A permutation is an arrangement where the order of which the objects are placed is important. In this section, we are going to arrange all the objects. The for the first slot there are five choices. The second slot provides four choices. Whatever is available for the second slot depends on what book was put in the first slot. For example, if I choose to put book A in the first slot, the books B, C, D, and E are available for the second slot. Instead, if I choose to put book C in the first slot, then A, B, D, and E are available. For each choice I make on the first slot, I get four choices for the second. Considering the first two slots alone, this gives me a total of 5 × 4 = 20 arrangements. Continuing in this way, there are three choices for the third slot, two choices for the fourth slot, and whatever is left over gets the fifth slot. Yes, 120 different arrangements. Since order is important, the arrangement is considered a permutation. until we reach 1 slot left for the last object. n × (n - 1) × (n - 2) × ... × 1 = n! Number of Permutations of n Unique Objects = n! Let's go back to our problem of arranging five books (A, B, C, D, and E) but this time, we only have three slots available. For the first slot, I have 5 books available to choose from. Depending on what I choose, I will have 4 books for the second slot. Each of those 4 books present a choice of the 3 books for the last slot. Whatever is left either goes somewhere else in the house or gets donated. The number of arrangements that are available to me has decreased due to the fact I only have three slots available. Hence, 5 × 4 × 3 = 60. Basically we are taking all of the ways 5 books can be arranged, and then dividing that number by all the ways the 2 books that are not going to be used can be arranged. nPk = n! / (n - k)! where we have n objects and k slots to fill. Permutations: nPk = n! / (n - k)! where n ≥ k. Order is important. Hi everyone! I am blogging from Coffee Klatch in San Dimas, CA! I was overdue for a latte. Their pumpkin brownies are to die for. Calculators have an upper limit when working with numbers. 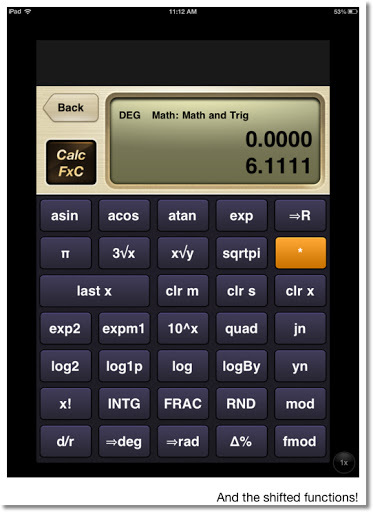 Typically, the scientific calculators allow numbers up to 9.999999999 × 10^99. Anything over 10^100 is considered an overflow. Some of the higher graphing and CAS calculators allow for higher limits. This means if you need to calculate anything over 69!, most calculators will give an "Overflow" error message. We can remedy this by using the laws of logarithms to calculate factorials of higher integers. Common logarithms (base 10) are used. Let T be this sum. (1) int(T) is the integer part of T. To find it, take the integer and ignore everything after the decimal point. (2) frac(T) is the fractional part of T. To find this, take everything after the decimal point and ignore the integer part. 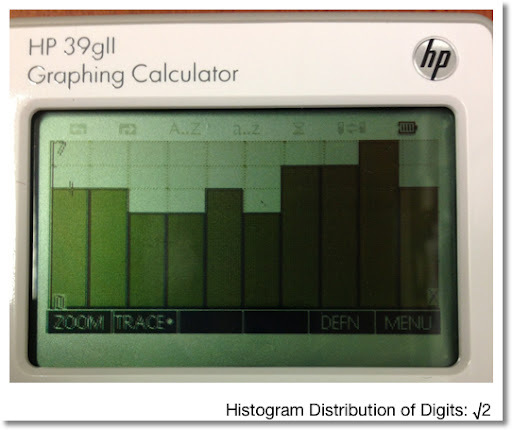 A lot of programming and graphing scientific calculators have the int and frac functions. 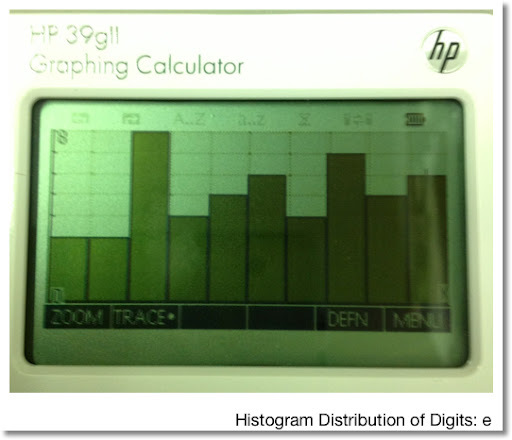 On most Hewlett Packard programming and scientific calculators, they are named IP and FP, respectively. Calculate 8! using the logarithm method. In this case, int(T) = 4 and frac(T) = 0.605520523. 1. 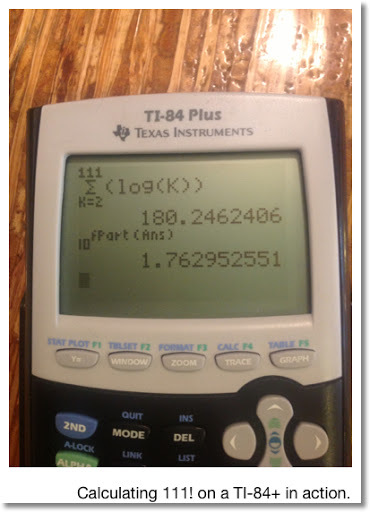 Calculate the sum ∑( log(k) from k=2 to 111). We find the answer to be 180.2462406. 2. Split the integer and fractional portions. Take the anti-common logarithm of the fractional portion. Hence, 10^0.2462406 ≈ 1.762952551. I round this answer to five decimal places to get 1.76295. And yes, typing out this long number is not as easy it sounds. Now we come to the programming portion of calculating n! using the logarithmic method. 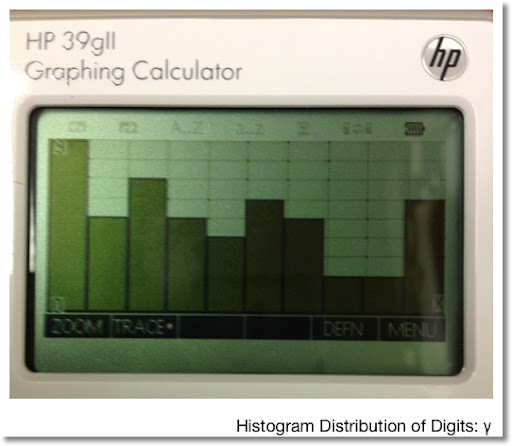 This program was done on a HP 39gii, but can easily adapted on most graphing/programming calculators. Here is a program in BASIC language. I used the App techBASIC from ByteWorks. Everything after explanation points signify comments. Thank you as always, I appreciate the comments and compliments. Hope you enjoy the weekend. Talk to you all soon, Eddie. Positive vibes and blessings. The above tasks will be accomplished by using a simple calculator. That means we have only the arithmetic functions, square roots, percents, and memory to work with. Now that we have our general solutions, how do we tackle this on a simple calculator? 1. Calculate the determinant. Keystrokes: A × D - B × C =. Note this number down on paper. The calculator's memory will be required to find x and y. The determinant is -9. Write this result down. Our focus for this blog entry will be finding real roots. 1. Calculate the discriminant. Store this result in the calculator's memory. One of the roots is x = 1. I hope this series is helpful. This series has showed how to make various calculations with a simple calculator: arithmetic procedures including fractions, area of a circle, distance between two points, calculating the total shopping bill, solving 2 x 2 simultaneous equations, and solving quadratic equations. With most calculators, if you have to add tax and subtract discounts, you can just execute the operation directly. × n % + (to add) and × n % - (to subtract). Here is how I prefer to work with percents, and it avoids the percent key altogether. Let A be the number you want to add N% percent to it. In a shopping application, N represents the sales tax. In construction, N can be thought be allowance for waste. Example: Add 10% to 19.95. Let A be the number you want to subtract N% from. In terms of shopping, N represents a discount. Example: Subtract 10% from 19.95. Ever though what your bill would be as you shop? This section will show you what the potential bill will be and hopefully will lead you to make smart shopping decisions, and keep in budget. 1. Clear Memory. We will use the memory register to keep track of our purchases. 2. Determine whether the item is subject to sales tax. You can press MR at any time to get a subtotal. 4. *If all of your items are subject to sales tax, add sales tax to the total. If the item or service is not subject to sales tax, use the keystroke sequence price M+ . If the item or service is subject to sales tax, use the keystroke sequence tax factor × price M+ . In California, where I live, generally food, grocery items, and most services are generally not subject to sales tax, while sales of tangible goods are subject to sales tax. Let's illustrate this strategy by a few examples. All items are subject to 8.5% sales tax. Well, since we are dealing with just taxable purchases, we can total everything and add sales tax at the end. All items are subject to 8.5% sales tax. In this case, we can add the sales tax at the end. Only the Ziploc bag is subject to 8.5% sales tax. Assume coupons take affect immediately (before sales tax). Here we must use the "mixed purchases" strategy. Enter $3.49 for the Ziploc bags. The total amount paid is principal and interest, in other words, P + I. Example 1: A bank makes a short term loan to Fred and Suzy of $1,000. The bank charges 9.6% interest on short term loans. Fred and Suzy have to pay the loan in two months. If Fred and Suzy wait for the two months, how much interest have they paid? The total interest paid is $16. Example 2: Terrell is looking over his credit card bill. The balance is $1,540.29. His credit card charges an annual rate of 15.99%. Terrell is planning to make a $300.00 payment. Assuming Terrell does not use his credit card for the next month, what will be his balance? Terrell's new balance next month would be $1,256.82. Example 3: Lita deposited $500 in a Double Your Money CD. The bank will pay her $1,000 when the CD doubles in value. The bank pays 7.5% interest on these deposits. How long will Lita wait? This time we are looking for T.
So it takes 13 1/3 years to double Lita's CD. She may want to rethink this investment. So this wraps up Part 4 of our Calculator Tricks series. Coming up in Part 5 we will tackle two common algebra problems. Just a reminder, a simple calculator has the following functions: arithmetic (+, -, ×, ÷), square root (√), percent (%), and memory (M+, M-, MR, MC). If your calculator has a MRC clear, this means press MRC once to recall memory, twice to clear it. Use the memory keys to solve this problem. Squaring a number is multiplying a number by itself. Apply the square root last. Strategy: Tackle the denominator first. Of course, anytime you have mixed operations, chances are you will be using the memory register. where r is the radius and π is the constant pi. In this series, I am working with an 8 digit calculator, I will use the approximation π ≈ 3.1415927. I can use less digits, but I want as much accuracy as possible. Example: Find an area of a circle with a radius of 14.5 inches. The area is approximately 660.51986 square inches. Example: Find the distance between the points (5,6) and (1,9). The distance between the points (5, 6) and (1, 9) is 5 units. With A = 3.9 inches, B = 2.4 inches. 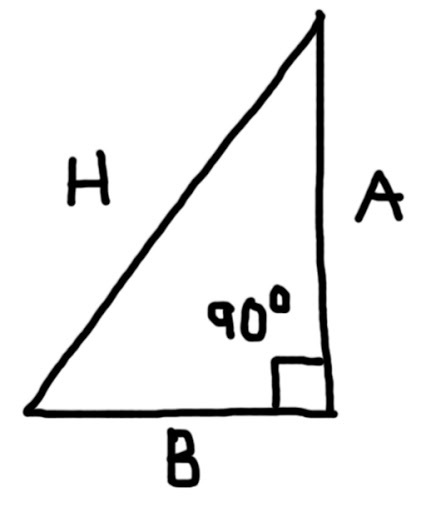 Find the area and the hypotenuse (H). The area is 4.68 square inches. The hypotenuse is approximately 4.5793012 inches. Next time in Part 4, we will cover shopping and short-term loans with simple interest. you can check it right here by clicking on this link. 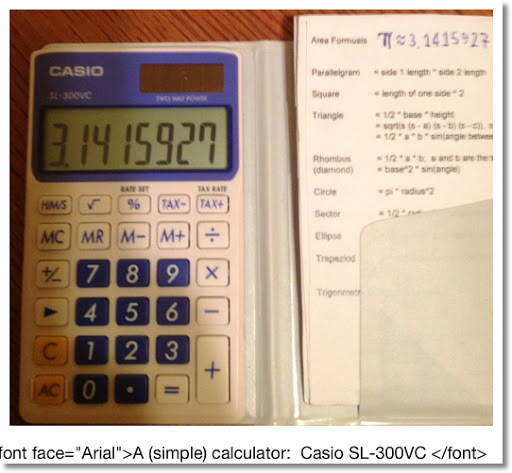 Simple calculators do not have the ability to display numbers as fractions, just their decimal equivalents. Remember the order you press the keys is critical, since the simple calculator operates in Chain Mode. 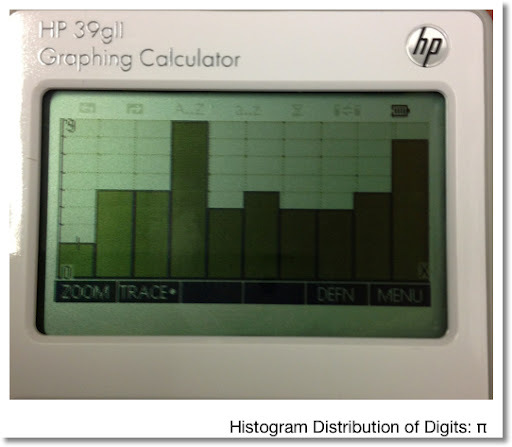 This blog assumes that you are working with an 8-digit calculator. Adding and subtracting fractions will require the use of memory. Remember to always clear memory before beginning a calculation. The decimal equivalent (0.3333333 on a 8-digit calculator) is what we are after in this example. We can use this technique to add and subtract more than two fractions. Depending on the calculator the last digit may be rounded or not. This result is correct to eight decimal places. Let's multiply the fractions A/B × C/D. Using some algebra, we can simplify this expression. Multiply the numerators, divide the denominators. Let's divide the fraction A/B by C/D. (Calculate A/B ÷ C/D) To divide number by a fraction, multiply it by the fraction's reciprocal. A strategy is to to covert mixed fractions to simple (improper fractions) first. For the mixed fraction A B/C is converted into the simple fraction (A × C + B)/C. Adding two mixed fractions will require the use of the memory register. Unlike multiplying simple fractions, multiplying mixed fractions will require the use of memory. We can get a form for an algorithm by simplifying. The display should be 37.5 (with the memory indicator). This is a complex algorithm, so it will take some practice. Let's do another example. The display should have 92.59259. In the next example we will add and multiply mixed fractions. Be willing to write immediate results on a note pad with complex problems. 1. Change 4 1/8 into a fraction and write it down. 2. Multiply the mixed fractions 3 3/7 × 6 2/3. 3. Add the resulting decimal equivalent of 4 1/8 to the result obtained from step 2. Note the result, which is 4.125. Don't store this number in memory, but on a notepad. 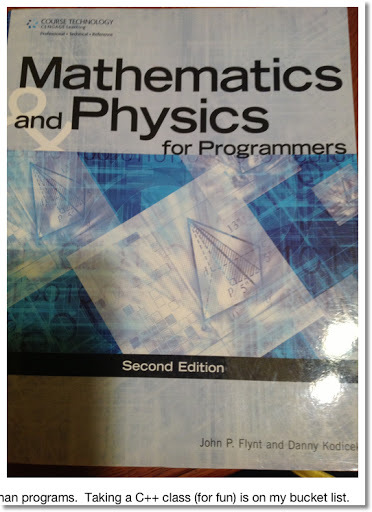 Add 4.125 obtained from step 1 to 22.857142 obtained from step 2. We have arrived at our result. The lesson here is to plan your calculation. 1. Change each mixed fraction to their decimal equivalent. 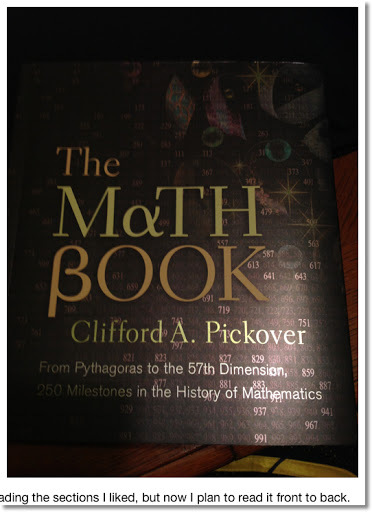 The next time we meet, we will work with square numbers, reciprocals, and some geometry. First of all, I am home taking care of my dad today. He's doing fine, recovering from surgery. I also want to thank everyone who reads this blog and leaves comments. I appreciate the input and conversation. Don't have a scientific calculator and only have a simple calculator with you? Interested in maximizing the abilities of a simple calculator? Want to impress your friends and co-workers? This series is for you. What do I mean by a simple calculator? it is the calculator that you find everywhere, not just produced by the big calculator manufacturers Hewlett Packard, Texas Instruments, Sharp, and Casio, but as a novelty item from companies with almost any color or design you like. 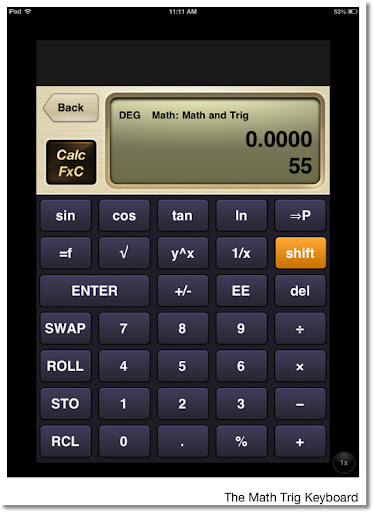 If you prefer, there are thousands of calculator apps on almost any cell phone, tablet, or iPod Touch. I refer to this type of calculator as a "four-banger" because it's primary functions are the arithmetic functions (+, -, ×, ÷). I estimate that 99% of simple calculators operate on chain mode. That is calculations take place as you enter them, without regard to the Order of Operations. You may remember the expression "My Dear Aunt Sally" or it's expanded version "Please Excuse My Dear Aunt Sally" as a mnemonic for the Order of Operations. Now using the proper order of operations, 4 + 2 × 3 = 10. However, calculators in chain mode don't "know" the order of operations. In that case, that calculator completes 4 + 2 first before multiplying the result by 3, giving a result of 18. So if you type 4 + 2 × 3 = , in that order, and get 18, your calculator operates in Chain Mode. This means we have to manually take the Order of Operations into account to ensure we get the correct answer of 10. One way to do this is rearrange the expression to 2 × 3 + 4. Typing the expression in this order will give us the correct answer, 10. For this series, we will work with calculators operating in Chain Mode, which covers about 95% of simple calculators. M+: Add whatever is in the display to Memory. M-: Subtract whatever is in the display from Memory. MR: Recall the contents of Memory. MC: Clears the contents of Memory. Often, you will see the key MRC. Press this key once to recall the contents of memory, twice to clear it. For this series, I will keep MR and MC separate. Just remember if you are working with the MRC key, pressing MRC twice will clear memory. The memory register is a key to advanced calculations on a simple calculator. One, it can help keep our calculations in proper operation. Second, it can store a number for later use. Your calculator will give an indicator ("M" or "MEMORY") whenever a number other than zero is stored in memory. The memory is consider cleared when 0 is stored and the calculator does not display a memory indicator. On to the Arithmetic Section. Let's tackle some common arithmetic calculations with the simple calculator to get the correct answers. Remember the order you press the keys is critical, since the simple calculator operates in Chain Mode. For each section, I will give a proper keystroke to tackle the problem. Then I will give an example. Each capital letter (A, B, C, etc.) represents a variable. This is a fairly simple expression. Just keep "Please Excuse My Dear Aunt Sally" in mind and you're gold. The result is 51, which the correct result with the Order of Operations. Now we have two multiplications to do before the addition. This is where the memory keys (M+, M-, MR, MC) come in handy. Before you start any operation involving memory, clear it first! Remember if your calculator has a MRC key, press it twice to clear memory. This is similar to problem 2. Note the parenthesis around the addition of B and C. This time we work the addition first. A strategy is to work the denominator first, store the result in memory. Then work left to right. Here are four famous numerical constants, extended to 50 decimal places: π, e, γ, and √2. For each constant, the approximation will be listed and a histogram of each of the 50 decimal places and the integer part (51 digits in total) will be presented. Of the four constants presented, √2 has the most even distribution, at far as the first 50 decimal points are concerned. Fun Fact: 99/70 gives √2 accurate to four decimal places. √2 Wikipedia: Retrieved October 2, 2012. Enjoy! This is something I wanted to do for a while, as I am fascinated by numerical constants.